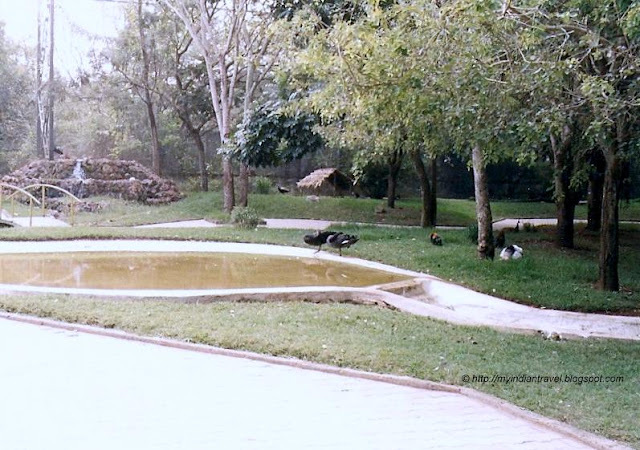 In the park on the Karanji Lake bed at Mysore an aviary is constructed. It measures 40 m in width, 60 m in length and 20 m in height. It is possibly India's biggest walk-through aviary. The aviary has an artificial water fall and two small water bodies. It has around 40 to 50 birds. Some of them are Hornbills, peacocks, white-peacocks, turkeys, black swans and more. One can also see tortoise here. Lovely photos of the aviary and the peacock is magnificent! Peacocks are always beautiful....nice shot! Love that galloping tortoise, too! Beautiful Peacock and Turtle. Lovely snaps. The aviary must be a fine place to visit. Have a Happy Day, Rajesh! Lovely place to visit. I bet that your boys enjoyed it too! Sounds like a perfectly wonderful place to visit. I adore white peacocks. The tortoise is pretty cute too. Would be a treat to spend time there!